Mount Jewett is a small village with a distinct Swedish heritage nestled along Route 6 in McKean County, Pennsylvania. Mount Jewett has an elevation of 2240 feet above sea level, the fifth-highest elevation in Pennsylvania. First settled by Swedish immigrants, today’s residents celebrate their Swedish heritage with a town-wide event featuring authentic Swedish food, dance and music. The Mt. Jewett Swedish Festival is held annually the second weekend of August. 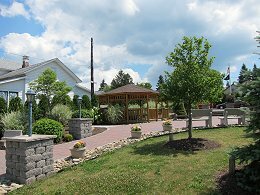 The Mount Jewett Heritage Park is located in the center of the village. 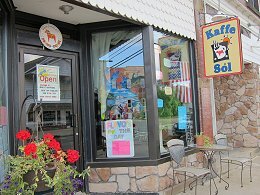 Jewett’s Kaffe Sol serves Swedish breads and other treats year-round for breakfast and lunch. 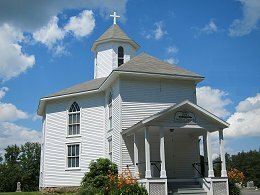 Just east of Mount Jewett is the historic Nebo Chapel. The Nebo Chapel, built in 1887, is an octagonal shaped church patterned after Ersta Kyrka at Danviken near Stockholm Sweden. The Kinzua Bridge State Park, home of the Kinzua Sky Walk with amazing views of the Kinzua Gorge , is located nearby at 1721 Lindholm Road. Open year-round from dawn to dusk, this day use park offers hiking trails, biking, fishing, and a new trail to the bottom of Kinzua Gorge. Lodging is available nearby at Barnhaven, or nearby at Lantz Corners Getaway.